This set of Embedded Systems Questions and Answers for Entrance exams focuses on “UART-2”. 1. Which of the following is used to reset the device in 8250? Explanation: MR is the master reset pin which helps to reset the device and restore the internal registers. 2. Which provides an input clock for the receiver part of the UART 8250? Explanation: RCLK provides an input clock for the receiver part of the UART. RD is the read signal. MR is the master reset pin and DDIS is used to control bus arbitration logic. 3. Which of the following is a general purpose I/O pin? Explanation: There are two general purposes I/O pin OUT1 and OUT2. OUT1 is set by the programming bit 2 of the MCR to a ‘1’ whereas OUT2 is set by the programming bit 3 of the MCR to ‘1’. These are active low pins in 8250. 4. Which of the following indicate the type of access that the CPU needs to perform? Explanation: RD and WR signals are indicating the type of access that the CPU needs to perform, that is, whether it is a read cycle or write cycle. 5. Which pins are used for additional DMA control? Explanation: The RXRDY and TXRDY are two active low pins which are used for additional DMA control. It can be used for DMA transfers to and from the read and write buffers. 6. Which of the following are not used within the IBM PC? Explanation: The CPU is responsible for moving data to and from the UART in the IBM PC, therefore it does not have TXRDY and RXRDY pins which are used for DMA accessing. 7. Which pins are used to connect an external crystal? Explanation: The XIN and XOUT pins are used to connect an external crystal. These pins can also connect an external clock. 8. Which UART is used in MC680 by 0 design? Explanation: The MC68681 is a standard UART developed by Motorola. It has been used in many MC680 by 0 designs. 9. Which of the following have large FIFO buffer? Explanation: The largest buffer of 16 bytes is available on 16550 UART which is used for high speed data communications. 10. Which of the following has a quadruple buffered receiver and a double buffered transmitter? Explanation: The MC68681 is a standard UART developed by Motorola. It possess a quadruple buffered receiver and a double buffered transmitter. 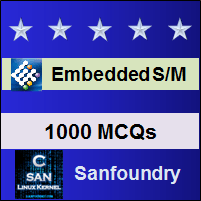 To practice all areas of Embedded Systems for Entrance exams, here is complete set of 1000+ Multiple Choice Questions and Answers.